WORCESTER, Mass. – All season long, the Franklin boys basketball team has relied on their defense and a balanced scoring attack on their way to the top seed in the D1 Central tournament. On Sunday afternoon at WPI, Franklin stuck to that formula in a 68-54 win over #5 Natick in the D1 Central Semifinals. The Panther’s defensive effort was in full force throughout the first quarter, as they limited the Red Hawks to just ten points to take an 18-10 lead. Franklin sophomore Chris Edgehill score seven of his team-high 19 points for Franklin, including a three that beat the buzzer to give Franklin an eight-point advantage heading into the second quarter. 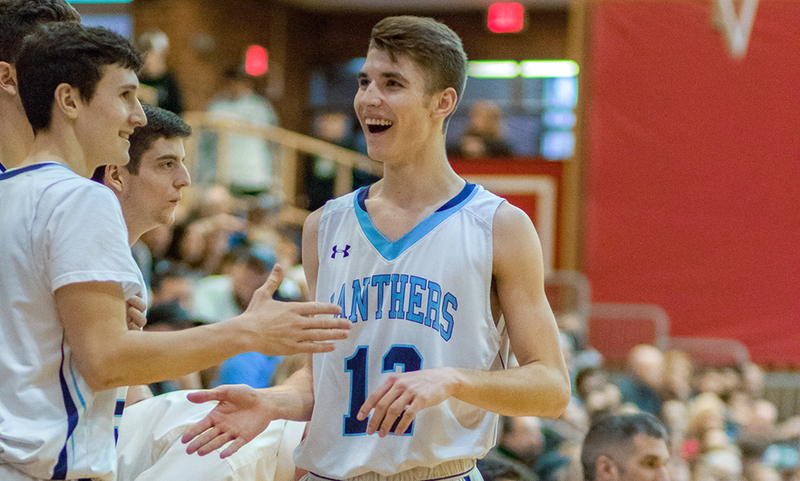 After Natick’s Will Bodnitzki (nine points, three rebounds) scored with just over four minutes to go in the first half to cut the Franklin lead to 26-17, the Panthers went on a 10-2 run and didn’t give up a field goal to close out the half. Threes from Paul Mahon (13 points, two steals) and Matt Elias (eleven points) highlighted the run that also included two free throws from Jack Rodgers (six points, eight rebounds, three assists) and a basket from Will Harvey (two steals). Jalen Samuels (13 points, ten rebounds, four assists), who sat most of the second quarter with foul trouble, scored Franklin’s first five points of the second half as he converted a layup before hitting a three on a nice assist from Rodgers. Late in the third quarter after two free throws from Mahon put Franklin up 51-30, Natick came storming back, going on a 9-2 run to close the quarter behind seven points from Jahden Erold (22 points, ten rebounds). After Alexander Cohen (three points, two rebounds) made a three with 2:15 to play to cut Franklin’s lead to just eight at 60-52, Edgehill erupted for the Panthers, scoring eight points in the last two minutes of the game, including a game-clinching three with 28 seconds to play in what would be the last basket of the game. Franklin (21-3) will face Algonquin (17-7) Friday night at 6:00 PM at WPI for the D1 Central title. The Tomahawks beat St. John’s Shrewsbury 82-70 on Sunday for the chance to play for their first sectional title since 2001.